Saudi Arabian equities have taken a nose-dive as tensions escalate between the Gulf nation and the United States over the recent disappearance of Washington Post columnist Jamal Khashoggi, following a visit to the Saudi embassy in Turkey. The Tadawul All Share Index sank as much as 7 per cent, the most since 2016 on a closing basis, before trimming its decline to 3.5 percent at the close. All but seven of the gauge’s 186 members fell. Yet only in June this year, US index provider Morgan Stanley Capital International (MSCI) announced that, effective mid-2019, Saudi Arabia would be reclassified to its group of Emerging Markets, sharply broadening the investor base for the country in a move that could be supportive of their equity markets. The Saudi situation has turned the world’s attention once more to Emerging Markets (EMs) – home to more than 80 percent of the global population and accounting for more than 60 percent of global economic growth. Although many investors recognise the potential of EMs, they also struggle to find the right investment approach to participate in these appealing markets. This article analyses the EM: its diversity (EMs span four continents and 20 time zones, and numerous currencies); its historical performance over the past 20+ years, in comparison to developed markets; its risk-reward profile; investor positioning for the best outcomes: and why, even though the year 2018 has brought extreme volatility and declines in emerging markets debt and equity, progress in key areas point to a recovery that could be within sight. Typically, emerging market (or developing) countries have low to medium per capita income but are growing to participate more fully in world economic markets. This includes countries that may become developed markets in the future, or were in the past. 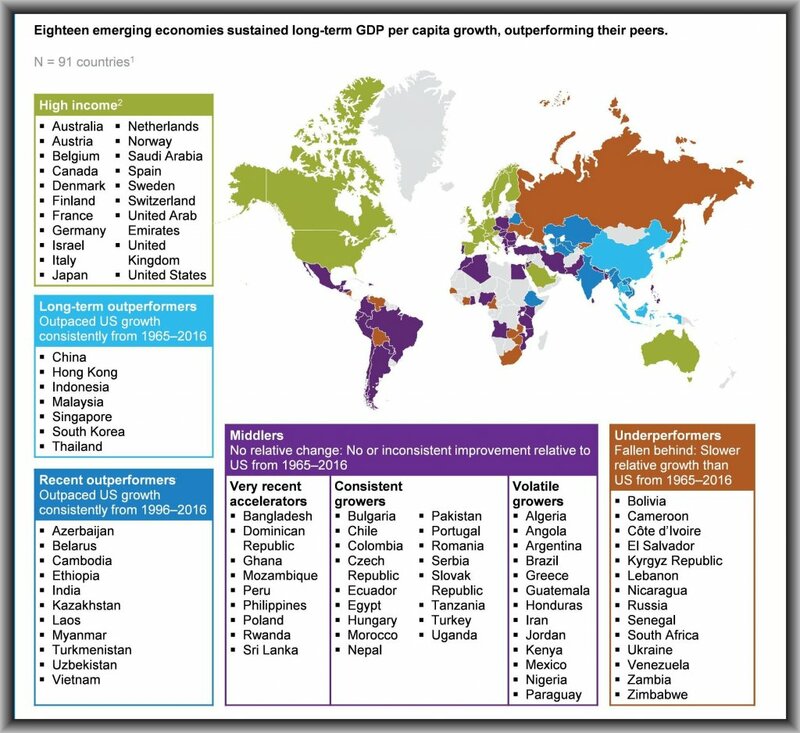 Both big countries such as China, and small nations like Rwanda are emerging markets: some EMs have achieved rapid growth over prolonged periods—fast enough and long enough to close a part or most of the gap with advanced economies—while others have not. NOTES: 1 This analysis excluded economies with populations of less than 5 million in 2016 and those with limited data availability. 2 For the purposes of the McKinsey report, high income economies have been defined as those that had gross national income per capita of $6,000 or more in 1987, when the World Bank first started classifying countries by income bands. The two exceptions are Hong Kong and Singapore, which are classified as outperformers in our report due to the high rate of growth during the period analysed. 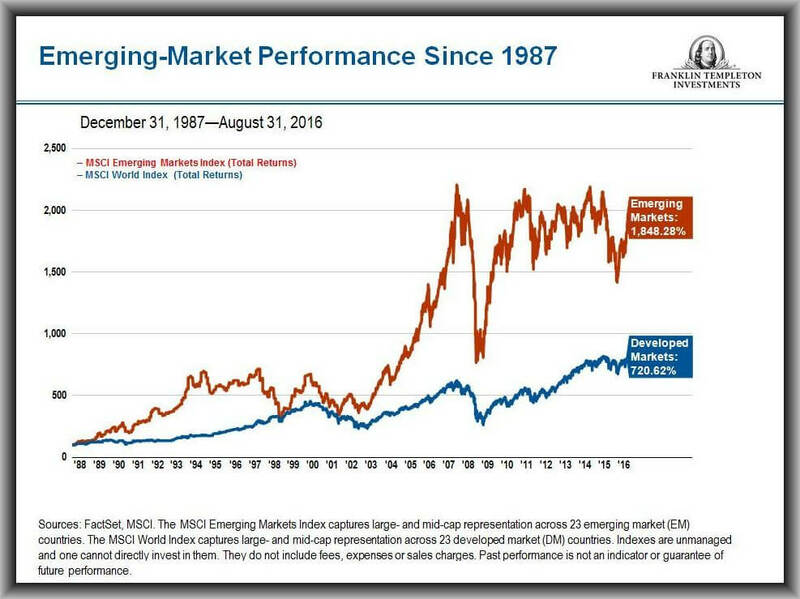 Despite greater volatility, less stability and superior growth potential than developed markets, long term investments in emerging markets (stocks, currencies and bonds) have outperformed the advanced economies for over 15 years. But in 2018, indices have fallen, pressured by concerns that rising US interest rates will push up borrowing costs. According to Yerlan Syzdykov (who oversees US$46 billion in emerging-market bonds and stocks at Amundi – Europe’s largest asset manager), a sustained rebound in emerging markets will only occur by the second half of 2019 when the U.S. economy starts to decelerate as the tax-cut boost wears off, the U. S. Federal Reserve holds back on interest-rate hikes, and the dollar loses steam. Syzdykov advises investors to be wary of a temporary bounce in the market after U.S. mid-term elections, when President Donald Trump is expected pivot from his current protectionist phase toward a “more pro-business” approach on trade issues. If everything is so volatile and risky, why do people invest? Because the rewards can far outweigh the risks if some basic caution is exercised, even in a sluggish market. 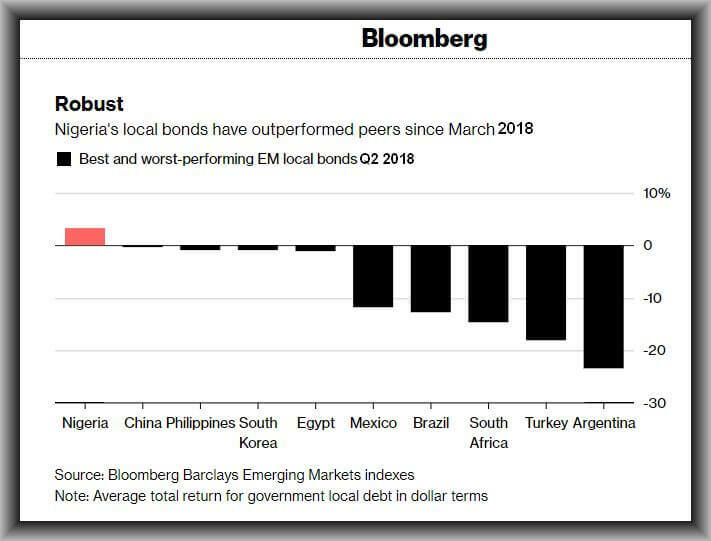 Here’s an example: As at June 2018 – amidst bearish trends in emerging markets – global money managers were bullish on Nigerian securities, enticed by average yields of 13.4 percent, which, while down from almost 17 percent in August 2017, were still among the highest in the world. Nigerian Naira bonds issued by the government had also returned 8.4 percent in dollar terms this year (see table below). UBS, the world’s largest wealth manager, cautions that investors would be mistaken – despite current market turmoil – in not putting enough money these fast-growing markets, saying recent market falls shouldn’t obscure the remarkable progress and transformation emerging economies and societies have made, as well as the greater depth and breadth of investment opportunities they offer. Explore: Tech stocks. Bets are being placed with one the largest stocks on Chinese markets – Alibaba: a company that is growing faster than Amazon, trading at one-fourth the P/E.” Alibaba is expected to post 44 percent sales growth this fiscal year, better than the 32 percent increase forecast for Amazon. Explore: Dollar-denominated bonds of Andean countries such as Chile and Peru, which benefit from a “very solid policy-making framework” and “fairly stable” economics and politics. This strategy offers some yield premiums without exposure to exchange-rate and inflation pressures. Dollar bonds are seen as a ‘defensive asset’ amid risks. Explore: Debt linked to oil, such as Nigerian bonds. Cautious: Although debt linked to oil is attractive, investment advisors are neutral on Russia because of its tensions with the U.S. Explore: Turkey’s dollar bonds, now that the country’s policy mix has started to change. Cautious: Exposure to Argentina is being reduced. Valuation-wise, it still is attractive, but the fear in Argentina is political change, given the pressures on the economy. 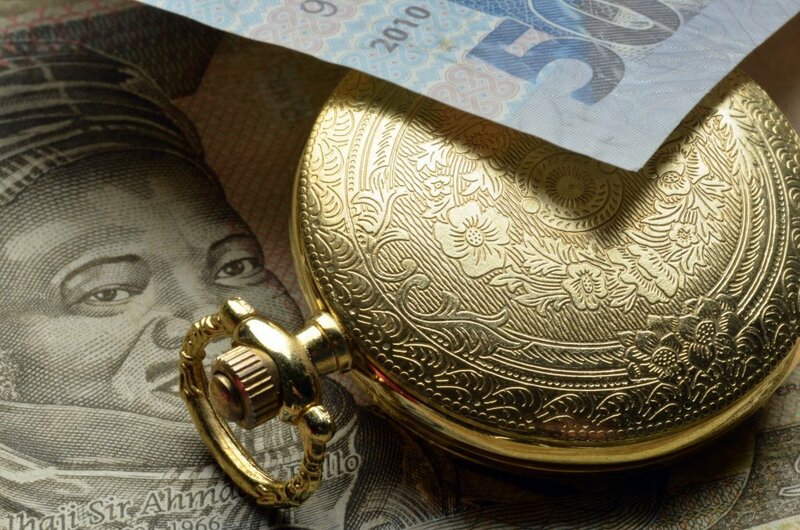 Depending on an investor’s objective and risk appetite, the importance of a sophisticated and well-structured investment process in Emerging Markets involves continuously monitoring the risks and return potential, and shifting allocations, to either improve the return profile or de-risk a given strategy. Holding a moderate risk, global diversified EM portfolio – composed of 40 per cent equities, 25 per cent hard-currency sovereign bonds, 25 per cent corporate bonds, and 10 per cent local-currency bonds – would be the optimal approach to adopt. 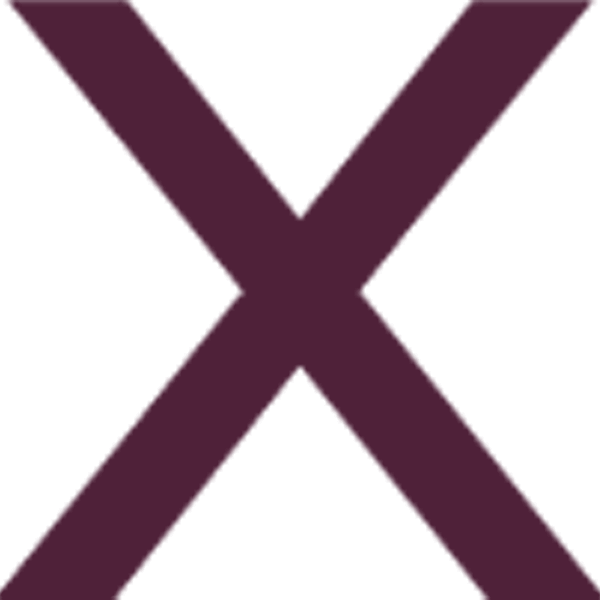 *Disclosures: This material does not provide individually tailored investment advice. It has been prepared without regard to the individual financial circumstances and objectives of persons who receive it. ARM Investments (ARMI) advises investors to independently evaluate particular investments and strategies, and seek the advice of a financial advisor or wealth manager. The appropriateness of a particular investment or strategy will depend on an investor’s individual circumstances and objectives. 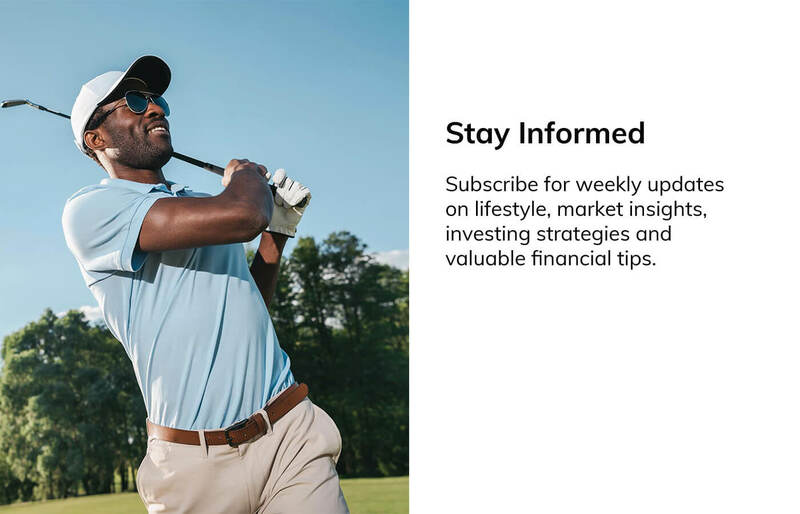 Subscribe for weekly updates from our team on lifestyle, market insights, investing strategies and valuable tips for your finances.